Television history was made on April 30, 1997, when comedian Ellen DeGeneres and her sitcom alter-ego Ellen Morgan, “came out” to her close friends and 36 million viewers. This groundbreaking episode represented a significant milestone in Amerian television. For the first time, a TV series centered around a lesbian character who was portrayed by an openly gay actor. The millions of viewers who tuned in that historic night were witnesses to a new era in television. THE PRIME TIME CLOSET offers an entertaining and in-depth glimpse into homosexuality on television from the 1950s through today. Divided into four sections, each devoted to a major television genre, this unique book explores how gay men and lesbians have been depicted in over three hundred television episodes and made-for-TV films. These include medical series, police/detective shows, situation comedies and TV dramas. 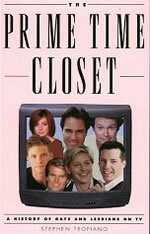 THE PRIME TIME CLOSET also reveals how television’s treatement of homosexuality has reflected and reinforced society’s ignorance about and fear of gay men and lesbians. At the same time, it celebrates programs like Ellen and Will and Grace that have broken new ground in their sensitive and enlightened approach to homosexuality and gay-related themes. This book is witty and insightful, accessible and illuminating, a look into what has become an integral part of American media culture.